5 star luxury cottage in Scotland. A truly coastal retreat. For bookings (and availability with pricing) please click here. Òran na Mara ("Song of the Sea" in English) is a beautiful 5 star luxury cottage situated overlooking a 2 mile white sand beach on one of the world’s most stunning locations - the west coast of the Isle of Harris, Scotland. These Scottish islands have been voted number 1 in Europe and number 5 in the world by Trip Advisor, and the beaches regularly appear in lists of the best in the world - and rightly so! This wonderful Scottish coastal retreat is the result of many years of planning, research and design, and is owned by Paul and Helen Honeywell who first came to Harris on their honeymoon in 1977. It was featured on "Homes by the Sea" on Channel 4. This is a luxury cottage of views. Overlooking white sand beaches, hills, islands, sunsets, and the ever-changing turquoise Atlantic ocean, this unique cottage takes maximum advantage of the incredible views by being curved with floor-to-ceiling glass windows in the main living area. Every room has a different aspect and interior design themed to the specific view from the window. The large 5 star cottage is planned as a contemporary space equipped with luxury facilities, but with traditional local features such as marram grass thatch and stone walling - these techniques are over 1,500 years old. It is insulated to the highest standards, and features a peat and wood fire stove in the snug area which divides the dining and living areas in this beautiful retreat . Even the TV has a lift so that it doesn't interrupt the views across the huge living area out to the coast, islands and hills when not in use. Òran na Mara has flexible space to accommodate a couple, a group of friends, or a family in luxury surroundings. Any or all of the three bedrooms can be configured to suit your needs. Òran na Mara is let weekly with a Saturday changeover day and outside the main season it is available for 3 and 4 day short breaks. It often books 2 years ahead, so please be prepared to book well in advance. It's worth the wait! Òran na Mara is the main feature in the popular Coast magazine. It was featured in the Sunday Times and on "Homes by the Sea" on Channel 4. Evenings and nights see the sea change from turquoise to a silver sheen, and the possibility of incredible starscapes with pollution-free dark skies - and even the northern lights if you are lucky. Moonlit beach walks are a special treat. Òran na Mara is an iconic building in a truly stunning location, and with a very high specification and level of design both externally and internally. It has nearly 200 sq m (2,000 sq ft) of interior space, with a carefully-planned layout to provide a flowing area with high domed ceilings which is flooded with light in the day, with outstanding views from all directions, and cosy and warm at night. The kitchen flows into the living space, and is equipped with a range cooker, professional cooking equipment, a Panasonic breadmaker, Nespresso coffee machine, and lovely crockery, cutlery and glassware. The dining table is a creative work of art, reflecting the unique environment of the Isle of Harris. Òran na Mara's interior was designed by Jane Blanchard, one of Scotland's foremost interior designers who started her work before a single stone was laid. Jane took great care to create an experience that celebrates the Isle of Harris and it's landscape and people. After dark, there are plenty of options from the "snug" area with panoramic peat/wood-burning stove, a huge sitting and dining area with high-quality bespoke furniture finished in beautiful fabrics, and lovely bedrooms and bathrooms. Every room has a theme based on the amazing views from the windows. Bedrooms can be configured as doubles or two singles. The two ensuite bathrooms are fully equipped, as is the "boat" bathroom (a special favourite) - Egyptian cotton towels and facecloths are provided, as are toiletries and vanity kits. Soft silk-filled duvets envelop you atop Hypnos beds, making getting up a challenge! If you really have to get up, each bedroom has a radio-controlled alarm clock as well as a hairdryer. A superb Sonos surround sound system allows you to listen to your favourite music throughout the house or in selected zones. Large smart TVs with satellite provide a wide viewing choice. One TV is on a lifting mechanism in the lounge area, with another in the study. 4G broadband wifi is available throughout this luxury Scottish retreat. If you are a golfer, Òran na Mara looks across the Harris Golf Course to the sea. The course is often referred to as the most spectacularly-situated golf course anywhere. All of our guests can play for free as we are proud members and supporters of the Club. We can arrange watersports, guided walks, fishing trips and other activities including a visit to the incredible St Kilda. 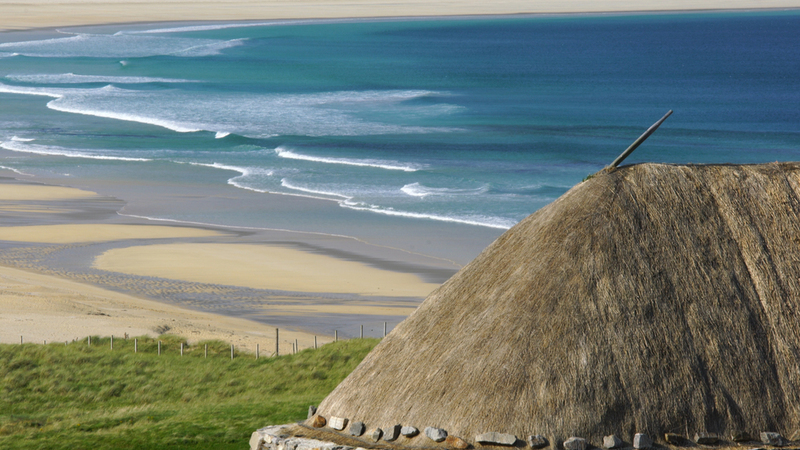 The beautiful marram-thatched roof is based on techniques over 1,500 years old, using turf and weighting stones as well as copious supplies of the local marram seagrass. Thatching was carried out by Neil Nicholson, an expert in his craft, from the neighbouring island of North Uist. The outside flows into Oran na Mara, with stones from Scarista beach acting as the enlarged threshold to remove those sandy boots!